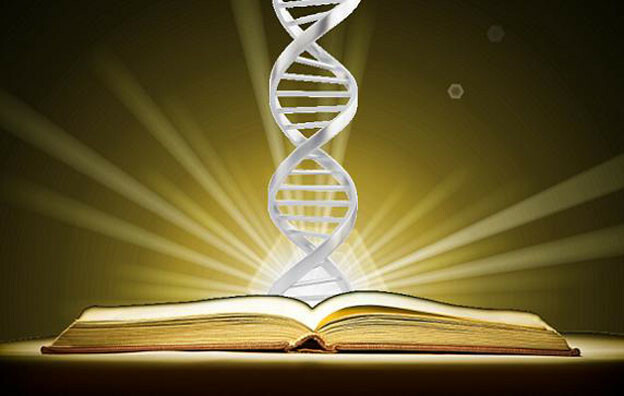 A gene, like a poem, is a message that is transitively semantic and inwardly self-examining of its own materials at once. When a post-Language poet like Harryette Mullen transforms the phrase “A frozen Indian acorn” into “afro zen in Diana corn,” she is conducting a lateral gene transfer via the chromosomes of syllables, and displaying the sensitive currency flowing between sequence and spacing and semantics. Schlegel claimed that for the truest poetry, every apparent part is a whole: fractally, almost every animal cell contains the recipe for the entire creature, in a kind of hologrammar in which the fragment in-folds the eventually unfurled completeness. Bio-poetics blends the Gutenbergian and the Darwinian to achieve such literal self-reflection: we are now capable of writing tissues (and eventually organs [and then animals]) out of neonatal fibroblasts and neuronal stem cells. In a related metaphor, Paul Shepard refers to a long-term tuning of the “DNA harmonic,” a metabolic music that bio-poetic art intensifies into a fabricated falsetto, via ribosomes that are like transcribing tone-arms “playing” the stored melodies of the genetic repertoire. In such art, visionary researchers strum on the lyres of sinew and ganglia and helix to discover and then adjust the pitch on particular melodies in the genetic canon. These analogies between letters and notes and atoms have been common in poetry and science from Lucretius onward. Muriel Rukeyser tells us that “The universe is made out of stories, not of atoms,” but for the bio-poet, every new arrangement of atoms is a story self-describing that particular arrangement of components. Viruses themselves have been importing novel sequences into our genome for ages, and so we humans have long been transgenic, and our body’s composition is quite accurately a written text. If DNA were truly and literally iconic (that is, a simplified image of what it “stands” for), we humans would appear as giant, walking super-molecules, quivering blobs of coded protoplasm. Instead, DNA is indexical and only indicates the complex and ever-transforming creature to come with its spiral dance: our external torso is itself a “torsion” or a twisting into shape from a central spindle. In crudely binary form, DNA is a speaker and protein is a listener or respondent, and the noise of potential mutation hovers at the edges of every genetic signal. Many poems benefit from a peculiar halo of noise in the form of layered connotations — verse has rarely been insistent on precise transmission, despite a few lingering Imagist dogmas concerning “direct treatment” and “natural symbols.” A too-clearly communicated poem always risks dead-ending into mere (and sterile) denotation, and so potential “garble” is generally a glad and productively entropic, fertilizing risk. Similarly, the popular idea of a single “gene for” a particular attribute is misleading since genes interact in a much more probabilistic, near-quantum manner, a process of dynamic flux always self-querying and self-editing. As well, bio-poetics is a materialism of meaning in which maternal “matter” and paternal “pattern” gender-swap and inter-blend. “Language is a vector for mixing the meme-pool” in Joe Davis’s phrase, but also “a virus from outer space” in William S. Burroughs’s assessment. These notions of words composed of (and not merely by) living, viral agents can be illustrated prosaically as well as poetically. Craig Venter’s “air genome project” is mapping the microbial and viral populations inhering in the very air we leverage and perturb into spoken words, an air our binary respiration draws from and lends to in a genetic swap-meet enacted as we speak our sentences. The traffic between words made by living beings and the genetically sequenced “words” that are codes for living matter is hence a rotational affair. Alice Fulton tells us that “atoms get commingled” because the seeming barrier between human and non-human nature (and living humans and their living language) is a “hectic membrane.” This interaction also extends to how language reconfigures our sense of matter, and how matter can remold our ideas on language. In the Pig Wings “xenotransplant” experiment conducted by the Tissue Culture and Art Project, a verbal folk idiom for improbability or unlikeliness (“when pigs have wings …”) is refuted by being realized in an act of transgenic writing. This experiment demonstrates how, just as figurative language can go beyond the physically possible, bio-poetic materials can go beyond the limits of idiomatic language.